Powerful, high quality and unmatched performance are watch words of the Weber Summit S-620 Grill. Built with the highest regard for the backyard master chef. It's made to last and built to perform. The stainless steel lid features a centered thermometer that accurately reads the inside temperature of the grill for pre-heating and cooking. For the ultimate in convenience, Summit Gas Grills comes with grill out handle lights that has a sensor that will put the spotlight on the food when the lid is opened. There is also a roomy storage area that is enclosed by stainless steel doors. Enough room to fit your LP tank or BBQ tools. 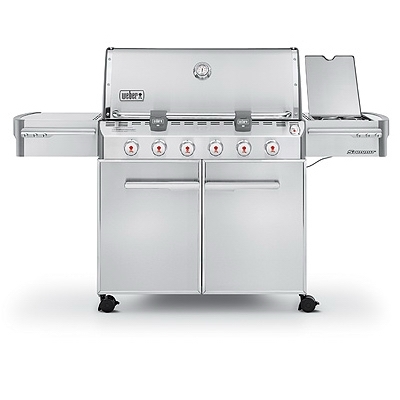 The Summit Gas Grill has large stainless steel work surfaces that flank both sides of the grill. Features a backlit LED tank scale, so you know how much gas you're cooking with and when it's time for a refill. 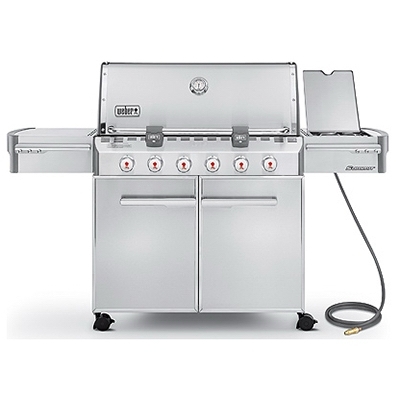 It also has a sturdy, 12,000 BTU per hour side burner makes this gas grill a complete gas grill outdoor cooking station! The burner is large enough to accommodate sauté pans as well as sauce pans - making it easier for you to completely finish your cooking process/meals at one time at one place.